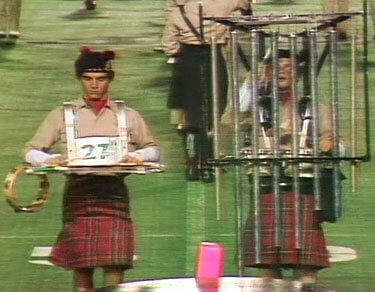 One thing that really stood out at the 2006 DCI Classic Countdown theater showings, was the strange looking contraption worn by a member of the 1975 27th Lancers' drum line—a rack that held chimes and numerous other instruments. I remember the chime cage vividly as 1975 was my first year in drum corps and 27th Lancers came into the Midwest early in the season. At the Classic Countdown, I heard a number of people react to the contraption. Via my friend and Fanfare contributor Stephanie Louden, I was able to contact Eddie Jacques, the man who not only carried the chime rack, but, as it turns out, built it as well. Here's his story. Eddie Jacques (right) performs with his homemade chime/bongo harness. My name is Eddie Jacques. I played the chimes for the 27th Lancers in 1975. As I remember it, I was to play tri-toms (triple tenors) for the Lancers. I didn't get to join the corps until April. At that late date, with the season just getting ready to start, the delivery of a set of toms could not be procured in time for the beginning of the season. The Lancers had one set of bells and one bell player, as well as seven or eight loose chimes. During this era of drum corps (pre front ensemble), you could not have anything (instrument, hat, helmet, rifle, flag, stick, etc.) come in contact with the ground. Most things to be used in a corps performance had to be carried onto the field of competition and carried throughout the performance. If something dropped, there was a penalty for it and even more penalties for picking the item up. Note: That year, it did become legal to set timpani down on legs to be played by one or more members once the instruments were marched onto the field by individual players. The timpani also had to be marched off the field. Items such as individual chime tubes could be grounded once played, but they could not be picked back up again until the show was over. Bongos were legal and the chime rack was built around the bongos. The chimes were added and used because they could be. I suppose that any number of individuals could have carried a chime (in say, a quiver on their back) to be played while their horn hung on a strap. We did not have bells and xylophone in 1975. We had one set of bells and one chime rack. I believe that if we had a second set of bells or a xylophone, we could have used them and still used the chimes. Note: Word is the chime rack was technically a bongo rack with chimes, not a chime rack with bongos, which supposedly got around the rule of the day that bells and xylophones were the only legal "mallet keyboards" allowed on the field. Tell me the difference between a chime and a cowbell. Both are extruded metal that when struck produce a ringing sound. They were accessories and legal. The problem was not legalities, it was logistics. How do we get the chimes on the field? The rack was born. I built that chime rack in my basement. I was an apprentice toolmaker at the time. There were constraints with the project. I didn't have much money, it had to be strong, but as light as possible, and time was a factor. The construction materials used on the rack were: parts of an old baby crib frame and an old cooler, some one-inch aluminum angle stock, nylon strapping, a large assortment of fasteners, some padding and some paint. I was allowed to use the milling machine, saw and drill press at work to manufacture the components. The chimes themselves were not all that heavy, just thin-walled chrome-plated brass tubing, and the bongos were light. The unit in its entirely might have weighed 60 to 70 pounds and was a little top heavy. I think the big bass drums, the tri-toms and the tympani all required strong backs and may have weighed more. However, they just looked better. I know the rack was not very attractive, but it was fun. In addition to the bongos and the chimes, it held a black "goodie bag" for sticks, mallets, assorted noisemakers such as woodblock, tambourine, vibra-slap and ratchet and a six-pack. Honestly, the thing that hurt the most after a long day of practicing wasn't my back, but my sides from all the laughing we did together. As far as getting around the rules and regulations of the day, it is my feeling that the 1975 27th Lancers really viewed regulations as assets, not limitations. This started right at the top with George and Patsy Bonfiglio, who put together an all-star staff that included George Zingali, James Wedge, Denise Bonfiglio, Peggy Twiggs, Ralph Pace, and Joe Marrella, to name just some. Live in the box and think outside it. They instilled in us the desire to be the best. A hard work ethic along with creativity and innovation, these folks and this large family from Revere become victorious over all but one corps—at least one time each—during the 1975 season. We finished first in many competitions, including the DCI East and DCI West regionals. We had fun. These Lancers had many firsts that year: double flags, rifles that twirled while lying down, a unique drill starting position in the upper left corner and the chimes. We were a revolutionary organization pushing the evolution of drum corps. I can't be thankful enough to the wonderful Bonfiglio family who gave me the opportunity to become a 27th Lancer and feel like a part of their family. I also wish to thank the Mauros, Levasseurs, Gallants and Cash families for taking me into their homes. My experiences could not have been better or even possible without them. I have many fantastic memories and stories from my time with 27th. Sometimes one will pop in my head and bring a smile to my face. Please know there was no suffering involved in my carrying of the cage. I loved every minute. 31 years ago I made a chime cage. Now I am New Product Design Manager for ETCO Research & Development Division in Sarasota, Fla. It's my job to create something new every day. The kid you see in that cage wishes he could be back there again, anytime. To all members of the 27th family, I love and miss you all. To all of our competitors: I miss you too. Where are they now? People like Bridgemen's Gene, Gene, the Dancing Machine, North Stars' phenomenal soprano soloist, Blue Devils' Bonnie Ott, etc. If you know any of these people and anyone whom you'd like to read about, or if you ARE anyone we should know (and that could be about anyone, for that matter), please drop me a line at boomike@dci.org.